It's taken me a while to work my way back to this show, probably because I burned myself out on tv shows earlier this year. And I have to admit that if I'd watched it back in September I probably wouldn't like it nearly as much. Well, it's February now, and Once Upon A Time is kind of ringing my bell. Here's the thing. It's kind of crap. Well, maybe crap is overstating. But it's not great television, let's get that clear. It's not terrible, but the writing is pretty consistently on the nose and a little awful, the plots are easily predicted and very lowest common denominator, and it suffers heavily from "cute child syndrome". So really, I should hate this show. But I don't. It's campy and the effects are terrible, the writing's horrible, the characters are cartoony and their motivations are overly simplistic. But it's fun. More relevant to our purposes here, however, it's also full of female characters. That's not a super-interesting statement on its own. I mean, most shows are full of female characters. We are half the population, after all, and people gotta breed. Romances must be had. No, what's interesting about Once Upon A Time is that of the main characters, almost all of them are women, and only one of those women is a traditional romantic heroine. Emma Swan, our protagonist, played with frowning mediocrity by Jennifer Morrison, is a bailbondsman turned small town sheriff. She's tough, a touch grim, and committed to doing the right thing, a concept that might have evaded her for the first 27 years of her life, but is sticking pretty hard right now. The best thing about Emma, though? Her main love interest is her son, Henry. Put up for adoption immediately after birth (Emma wasn't in the best place to have a child--prison, and all), he finds her on her 28th birthday and recruits her to save his town from the Evil Queen, also known as his adoptive mother. Henry also insists that Emma is the daughter of Snow White and Prince Charming (which makes him their grandson), and that she was sent by them from the fairy tale world into ours to keep her safe before the Evil Queen's curse hit. Emma doesn't believe him, because she's still got a brain. But she loves this kid, who she barely knows, enough to want to stick around in town and protect him from his overbearing, unloving adoptive mother. And that makes her rock. There are worse relationships to have. Mary Margaret, or Snow White in the fairy tale world, is a lot more a regular romantic heroine. She's a schoolteacher who can cajole birds to perch on her finger. Well, she is a Disney princess come to life. She happily offers her spare room to Emma and they bond, though both are a little weirded out by Henry's theory that they're mother and daughter. She dates, she flirts, and she pines. Oh does she pine. Because in this world, Prince Charming is an amnesiac trapped in a loveless marriage, and she's the woman he actually loves. So she pines. But as Snow White, she's actually pretty cool. She defies the Huntsman, and eventually he lets her go. 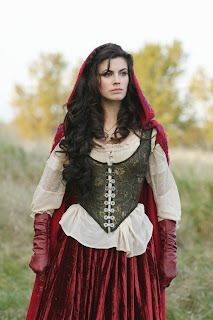 She lives in the woods as a bandit until she robs Prince Charming's carriage and he chases her. Their relationship is built on mutual respect and a little bit of distrust. She's a bandit and he's an unhappy noble. I can dig a fully self-sufficient woman. You go girl! But not your real world version. She's a little emo for my tastes. She has the best wardrobe. Ever. And finally, on our main characters list, there's the Evil Queen, aka Regina King. Yes, she's sociopathic, crazy, and pretty much full on evil. Sure, she cast an entire world of people into a living hell so that she could feel better about herself. And, fine, she's a really awful mother. But isn't it refreshing to watch the good guy and the bad guy trade barbs without any testosterone involved? Just nice, healthy doses of crazy-making estrogen. Regina's evil, a particularly prancing, mincing kind of evil, but it's nice to see a female character take this on for a change. In fact, I think that's my overall point. No, the characters on this show aren't nuanced. At all. And the show itself is really only so-so, addictive though it may be (and it is). But the lure of watching strong women go up against each other every week? Not for the love of a man (though a little bit for the love of a small boy), but in a good old fashioned fight between good and evil.